It is officially the summer season, and the museum is buzzing with activity. As I write this letter, I keep reflecting on the students in our first summer camp last week, learning about what we do behind the scenes, before heading to our studio to make unique pieces inspired by works on display. 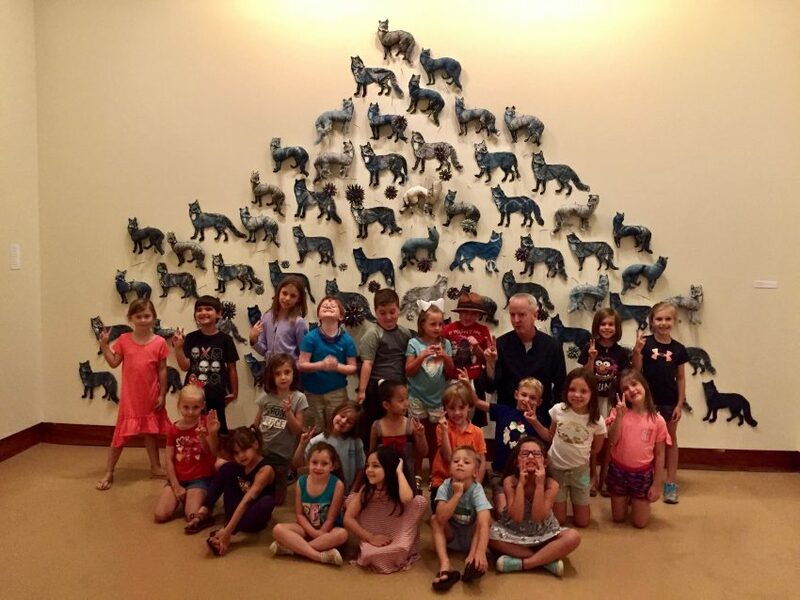 We have classes for all ages throughout the year, but we see hundreds of students during the summer months and they always remind me of the inspiration waiting around every corner of the museum. 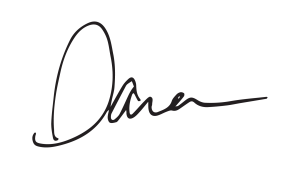 Education is critical to the work we do at WMA, providing a foundation for creativity in our community, as well as important skills for our students as they prepare for higher education or the workforce. Exposure to the arts unifies guests of all ages, races, and socio-economic backgrounds, and one of the unique ways we educate is through access to contemporary art and artists. During the first camp of the summer, Discovering Art, students received guided tours of the galleries and even got a chance to visit the vault. We discussed why it’s important that we collect and preserve artworks for generations to come, and I am hopeful that some of those students will be our future museum and arts leaders. 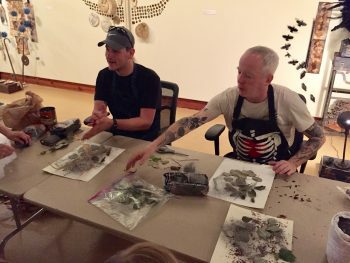 While we have many opportunities for learning, including classes, workshops, and artist lectures, WMA is committed to nontraditional learning as well. 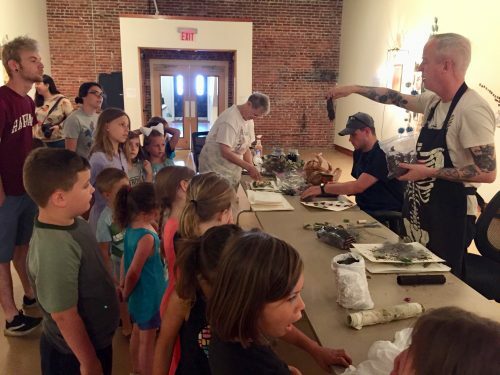 Some of the most inspiring moments I have witnessed at the museum are when we connect our students with “real live artists.” Doug Baulos, the artist responsible for the exhibition Alabama Reckoner, was visiting for several days in June for an artist talk and workshop. On Friday, the last day of our Discovering Art camp, Doug set up a workstation in the gallery and, along with friends and fellow WMA exhibiting artists Pinky Bass and Jacob Phillips, started making art. The three artists prepped paper and fabric for the weekend workshop for adults that Doug and Pinky would be teaching. Students were able to observe them working and asked questions about their art. It was a unique experience, and the campers were excited to show off their own work from week. 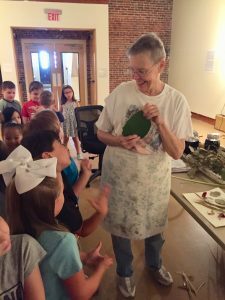 The artists visited the classroom and talked with the students as they curated their own exhibitions, consisting of the pinhole photographs, cyanotypes, and the natural-dyed fabric that they had hand-stitched into small quilts. These are the moments that spring to mind when I think about the impact of the arts. Making connections and inspiring creativity is what the museum is all about! I hope you will join us at WMA this summer to find what inspires you. New exhibitions open at Art After Hours on July 19 and include B18: Wiregrass Biennial with 40 artists from across the Southeast, Folded Forms: Work by Hugh Williams, an exhibition of ceramic work by Tony Wright, and Letters, Etc. showcasing work from Clayton Colvin. Third Thursdays, our new extended-hours programming, continues throughout the quarter with Write Night and Screen on the Green. And, summer wouldn’t be complete without everyone’s favorite party – #theHOTTESTpartyoftheyear – Yard Party for Art on August 11, featuring four regional bands, spoken word performances, and immersive art installations in the yard. We’ve got a lot to offer – don’t miss out on all the fun. See you at WMA!